8mm Milform. 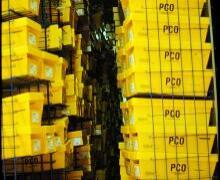 Stackable, Returnable shipping containers. Milform Automatic Pick Bin Storage and Retrieval system. Milform shelf divider attached to metro cart to protect and contain individual parts. 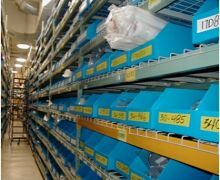 Custom Milform Shelf bins increased space utilization. Milform bins are available in a variety of shapes and configurations. Milform's® patent pending technology forms containers with heavy duty corrugated thermo-formed walls. 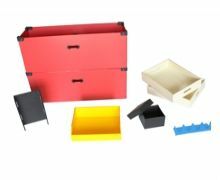 This is done without the high tooling cost and long lead times of conventional molded plastic containers. The Institute of Packaging Professionals awarded Mills Industries of Laconia NH an Ameristar Award for the Milform® process. The submission was one in a series of Milform® 6mm process bins. Replace existing corrugated paper bins with longer lasting Milform® bins. Eliminate sharp edges on the container, using the Milform® process. Have a fully recyclable container (i.e. no extraneous wire reinforcements). Maximize use of floor space, pallets, work areas, shelf and storage space. Provide a series of different sizes without expensive tooling costs but with short lead-time. Provide prototypes for evaluation and testing. 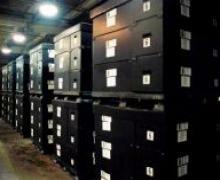 Provide a container that can be used with automatic storage and retrieval systems. Provide a container of user-defined color and custom imprint. Provide a tote with removable label placards. Milform® is the competitive alternative to conventional custom reusable containers and packaging. The new patent pending Milform® technology reduces cost and lead-time to develop new containers. Milform® is cost competitive because it cuts the time needed to setup and manufacture container. Also prototypes are available for testing and evaluation. Handle parts individually for inspection and QC. Wrap and unwrap parts with individual protective packaging materials. Count and perform other inventory functions. Milform® containers can be designed with inserts to maintain proper part presentation, visibility and lot integrity. Milform® eliminates the need for secondary operations and materials such as sonic welding and wire reinforcements that are typical with corrugated plastic containers. Milform® gives lightweight yet durable part protection. yields great stacking strength as well as enhanced protection from impacts. part to part contact and damage to finished surfaces. The patented Milform® process forms profile extruded co-polymer polypropylene and high-density polyethylene corrugated plastic. Milform® containers are available in a thickness of 6mm to 10mm. 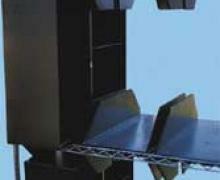 In the Milform® process sheets are cut, thermally scored, folded, and edge welded. The process is fully automatic and computer controlled. available in recycled material and are fully recyclable.